“Would you like to have a go?” Helen asks the curious schoolboy on his way into Tesco after school. 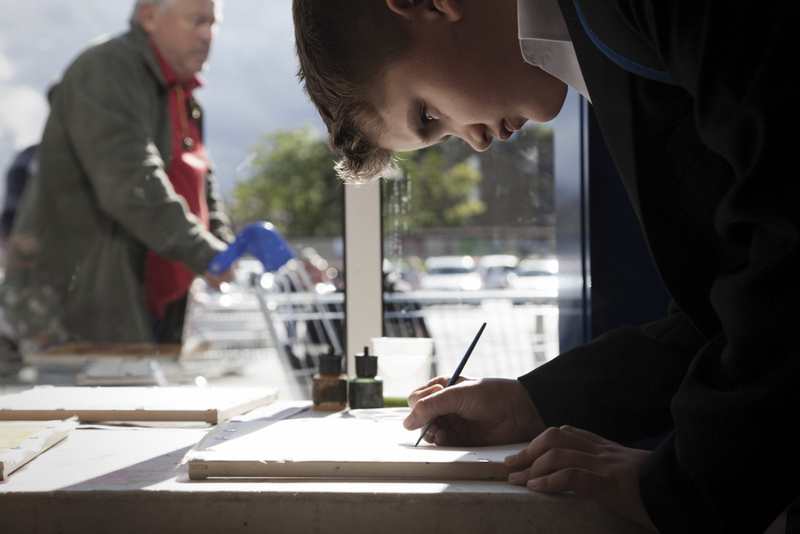 He and his mum approach our table in the Cleckheaton store’s foyer and 12-year-old Kane takes a brush, dips it into the palette and paints onto the silk. 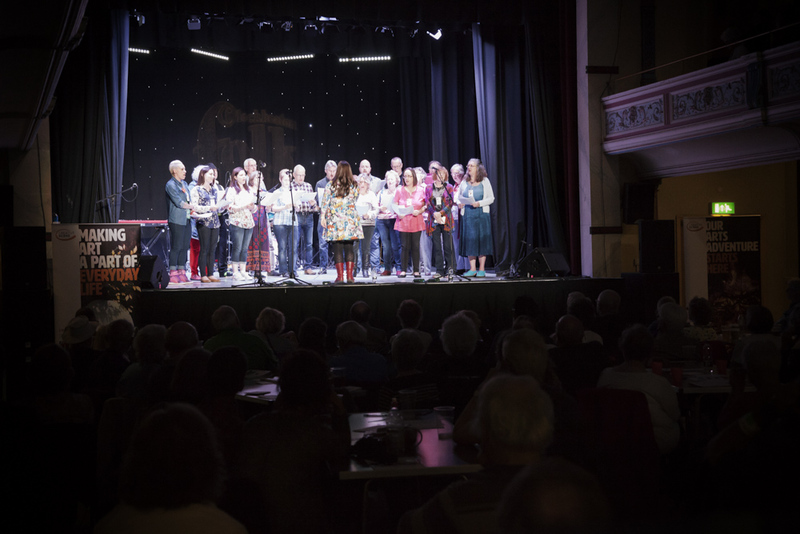 Now in its 30th year, the Cleckheaton Folk Festival is well established on the national folk calendar. 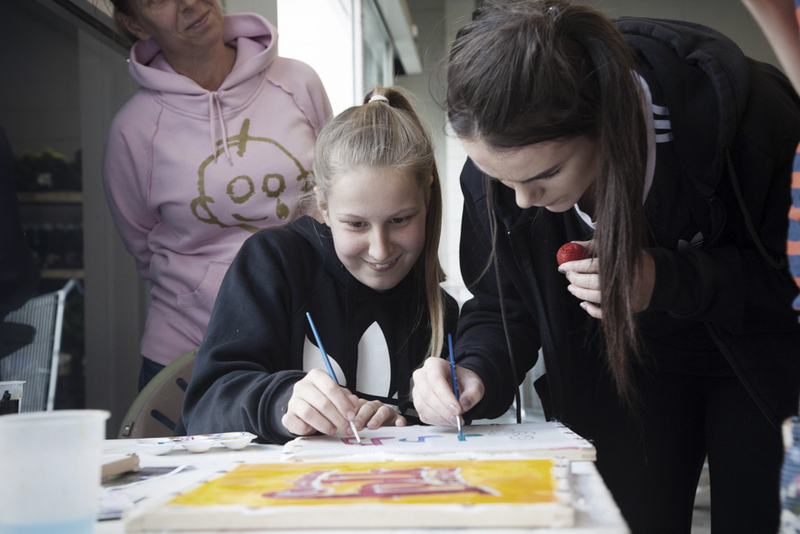 Over the last three years Creative Scene has supported a programme of arts activity that encourages more local participation. 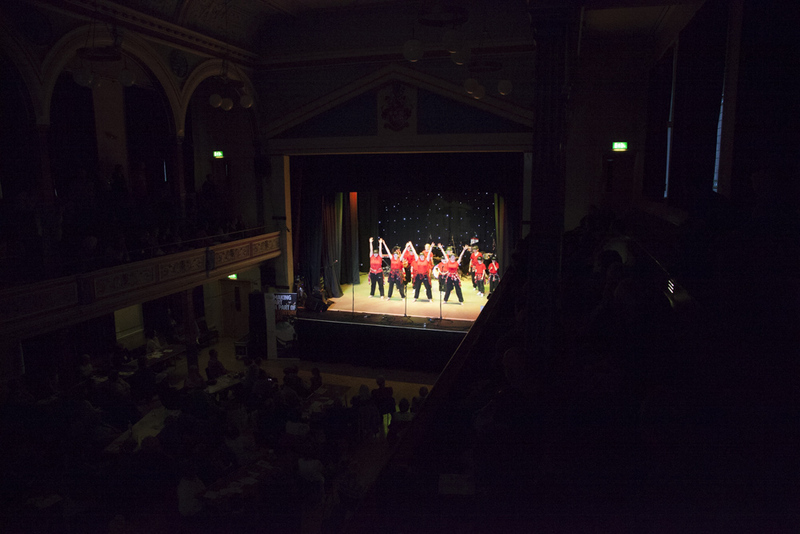 Last year I reported on the amazing dance and vocal workshops that culminated in a local dance troupe and a community choir performing on stage with the acclaimed Demon Barbers. This year Wakefield-based Edgelands Arts has devised a new project involving a ten-foot heron. “We’ve performed at the festival in previous years,” explains artist Tony Wade, “and when the opportunity to create artwork with local people came up, we leapt at the chance. 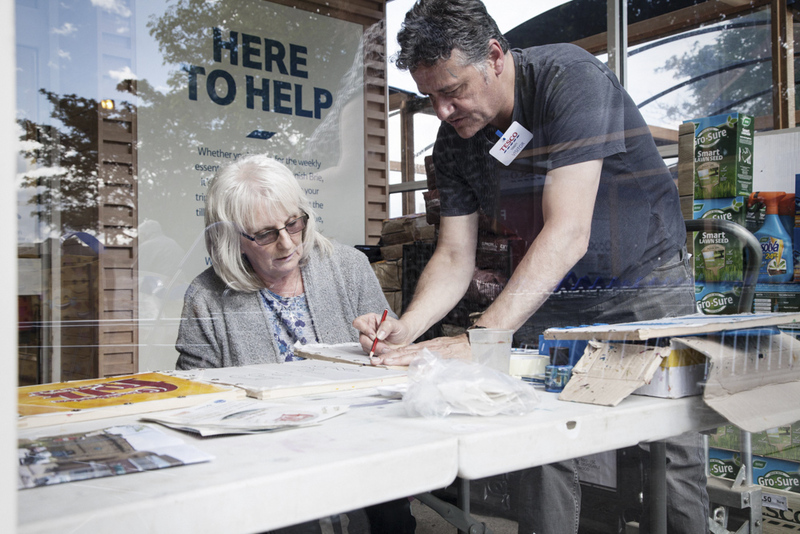 Edgelands’ heron puppet will appear at the festival parade on Saturday morning and, with an ‘ornithologist’ in tow, will guide people on a tour of its feather banners scattered around the town. “Is this one?” I ask, pointing out an image of The Battered Haddock chippy. Tesco is busy this evening: people on their way home from work, lanyards flaying; parents with their kids, dashing to get something for their tea. Already Tony and Helen have worked with primary schoolkids at Howard Park School and with a group at St John’s Church. Next week they are off to Matthew’s Coffee House on Market Street. Amongst the shoppers Cleckheaton Folk Festival organisers Dave and Janice pitch up to take a look. Dave tells me he’s been involved in the Festival for 15 years, the last ten as Festival Director. “And this year is the 30th anniversary,” I say. “And we’re going to have a ‘pearl’ of a festival,” he says with a smile. “We’ve worked with Creative Scene for the past three years and it’s been really good. They’ve helped us publicise the event and get local people involved which is what they’re about. 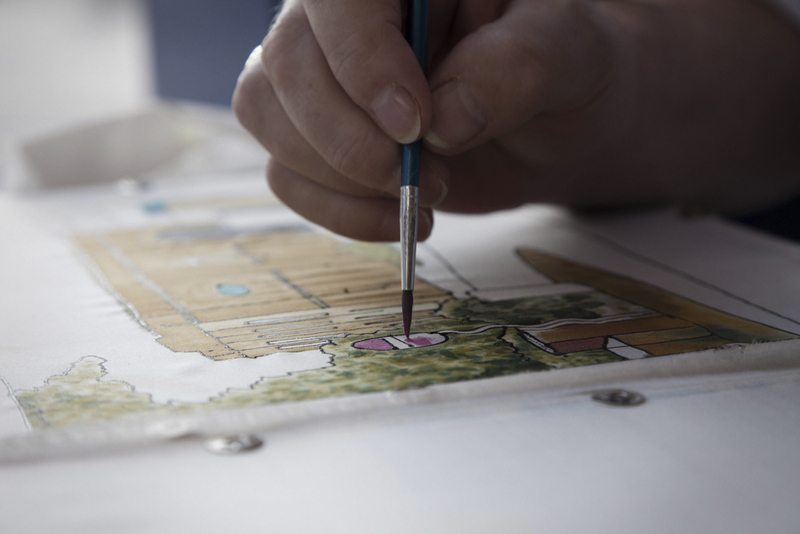 “Are you having a go?” I ask, nodding towards the silk painting. 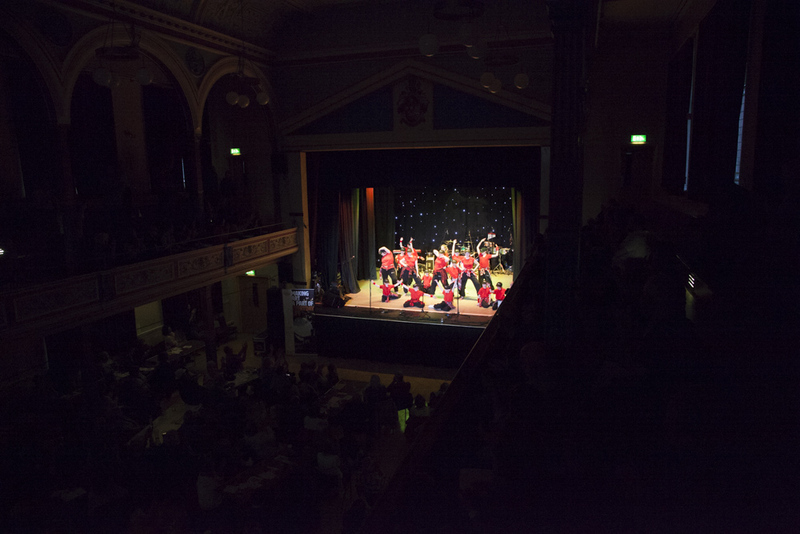 It’s the big night at Cleckheaton Town Hall. 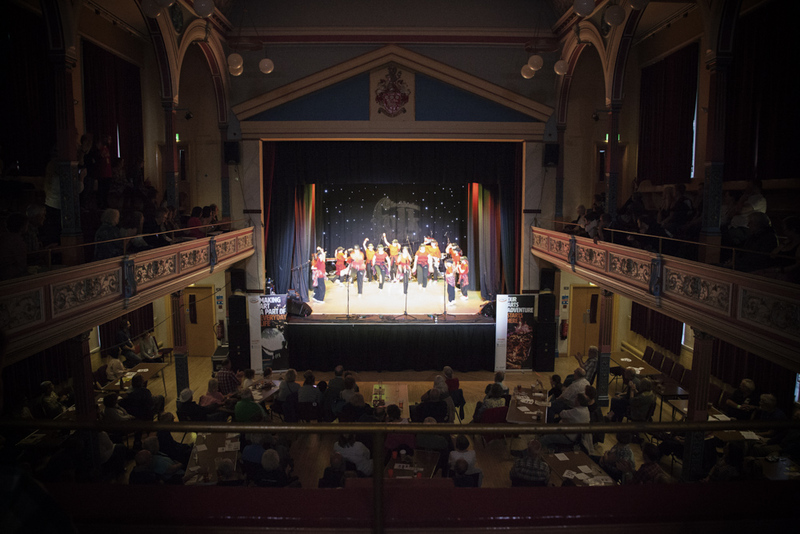 Over the last few weeks on this blog I’ve been following the rehearsals of local singers and dancers who are now about to perform at a folk festival for the very first time. 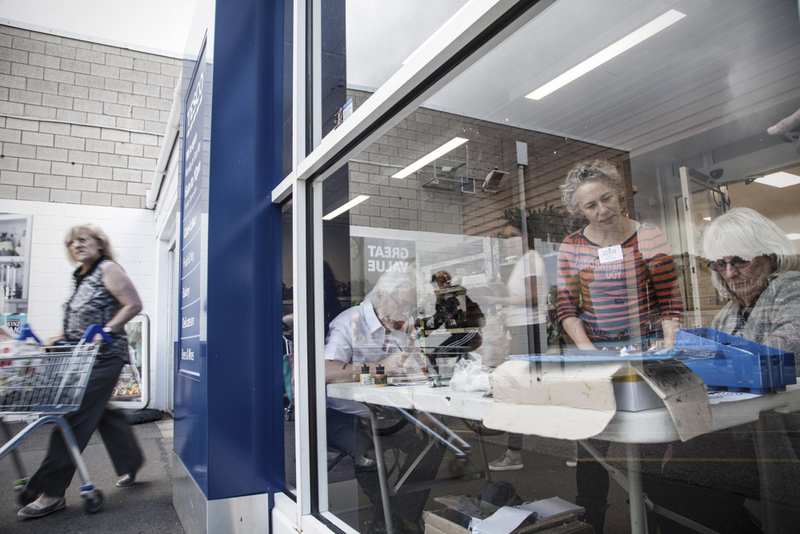 Working with band members from Cleckheaton Folk Festival headliners The Demon Barbers, the community groups have already warmed up this afternoon with some workshops. 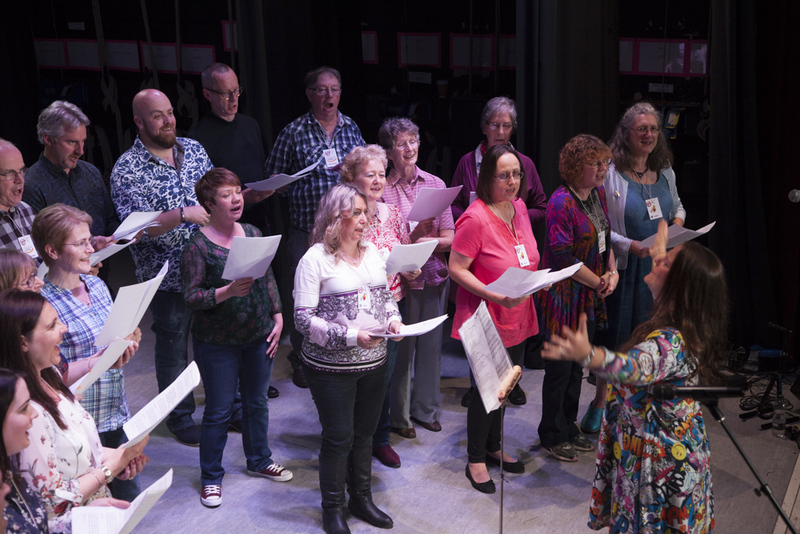 While waiting for their slot I catch up with members of Batley Community Choir who have joined forces today with the Festival Choir, assembled especially for tonight. “I can’t wait to see it all come together,” I say. Since I photographed them rehearsing with Demon Barber vocalist Bryony Griffith the choir have sung at the commemoration event for Jo Cox in Batley Town Square. Their rendition of The Rose was originally performed on live TV the day after their MP’s death. 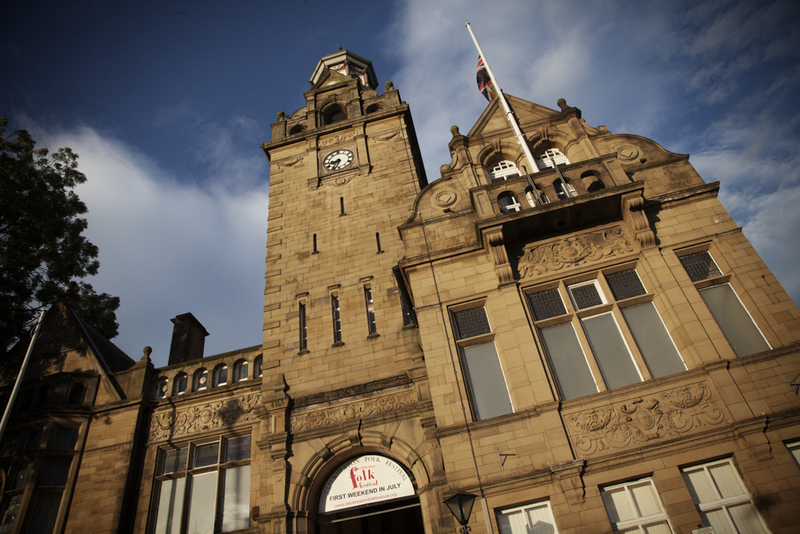 Tomorrow they’ll record the song as a charity single in Batley Town Hall. “We’re in good voice,” says Harold, enthusiastically. 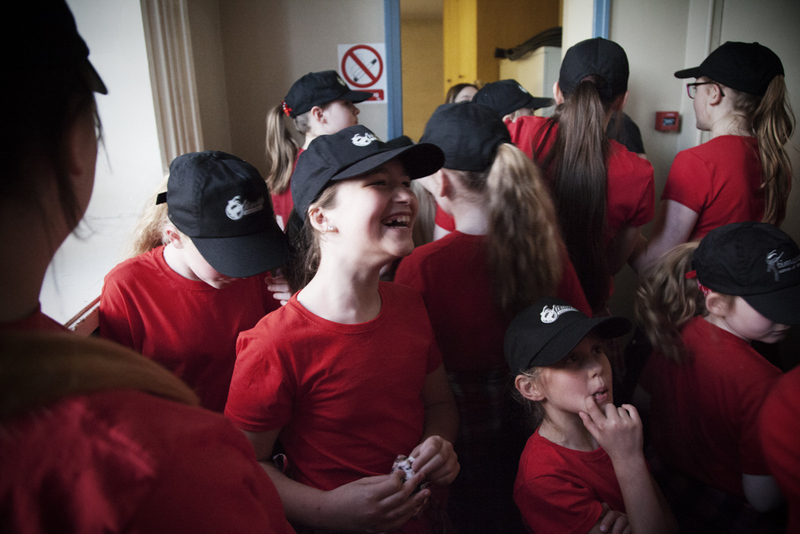 The TimeStep dancers wait excitedly back stage. “Are you nervous?” I ask 15-year-old Taylor. 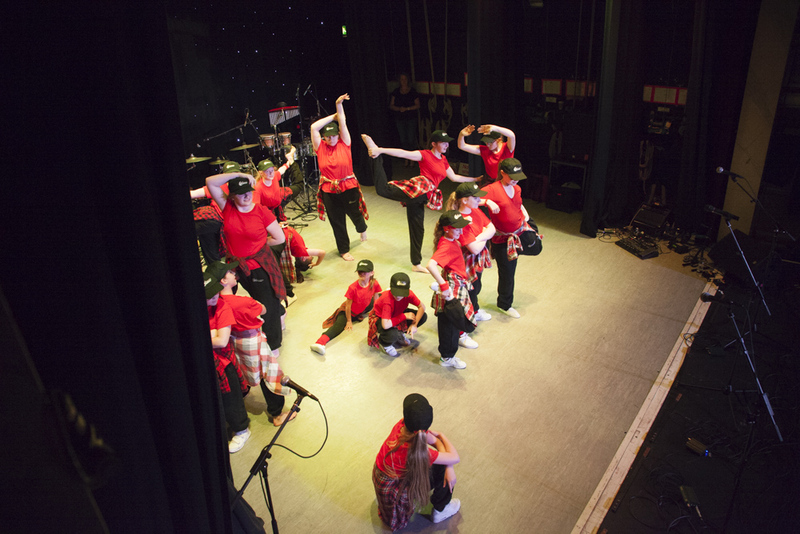 What follows is a high-energy dance routine that fuses hip-hop with street dance. 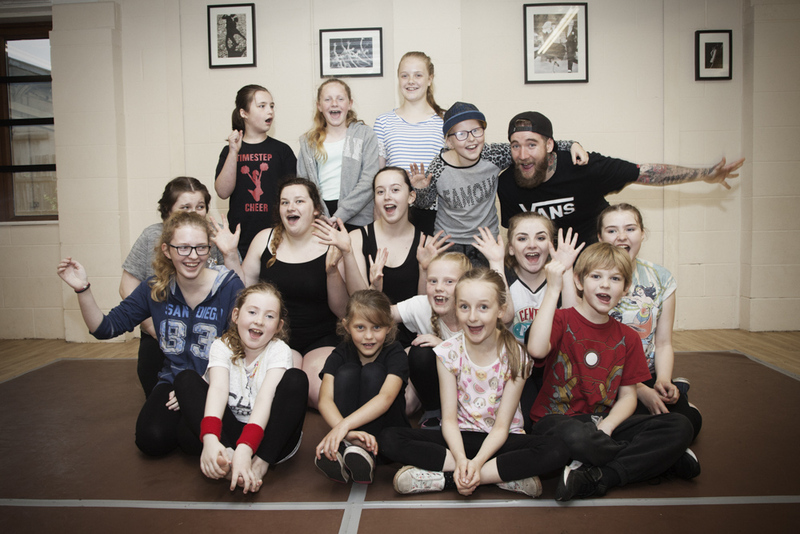 These young people – more familiar with ballet, tap and musical theatre – spectacularly make it their own. 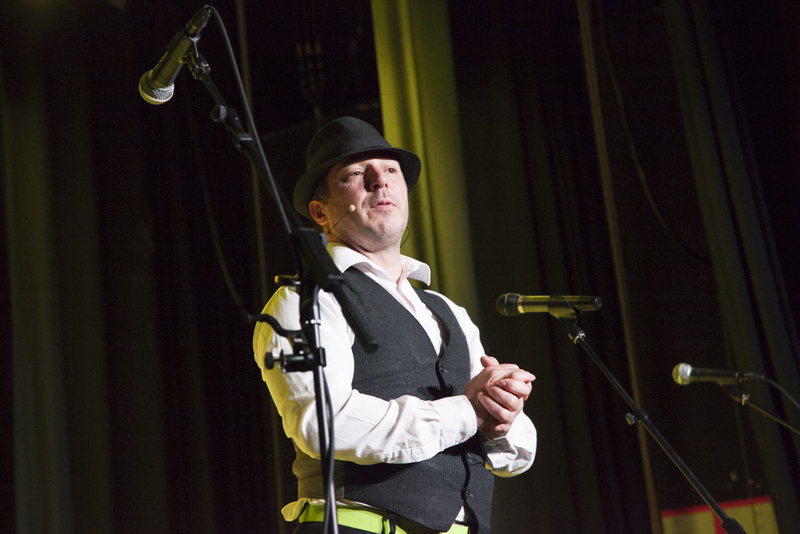 The audience loves it and the deafening applause, whoops and hollers puts big grins on the faces of the young performers. 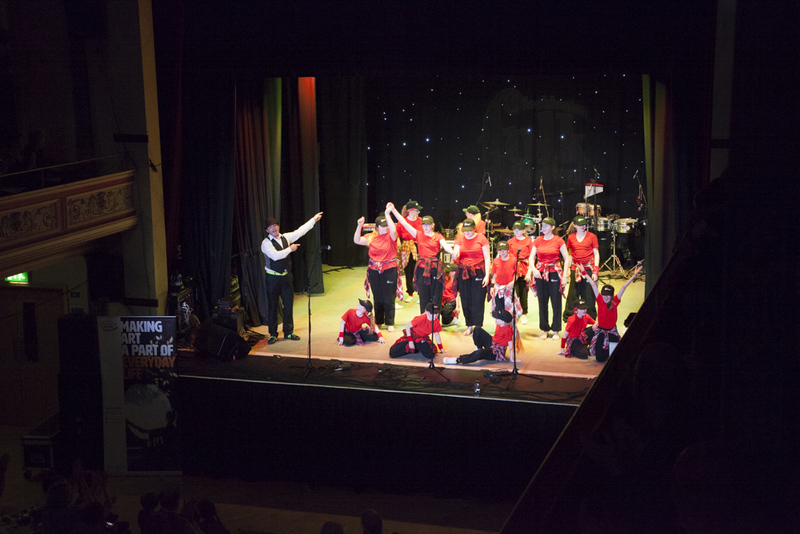 After a group of sword dancers do some frightening moves with bendy metal swords Bryony introduces the joint choir she’s pulled together. “This is our debut performance at a great big posh concert,” she says into the microphone. “It’s very exciting. 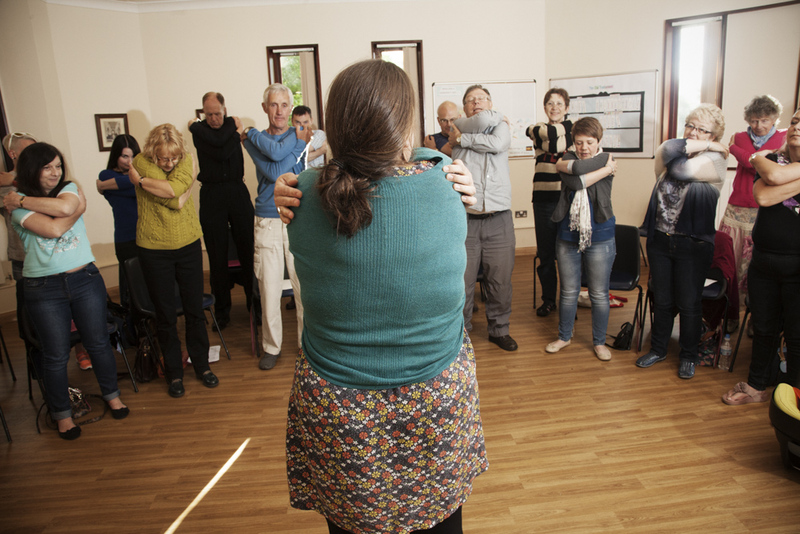 We have two groups that have come together after only three weeks of rehearsals each. 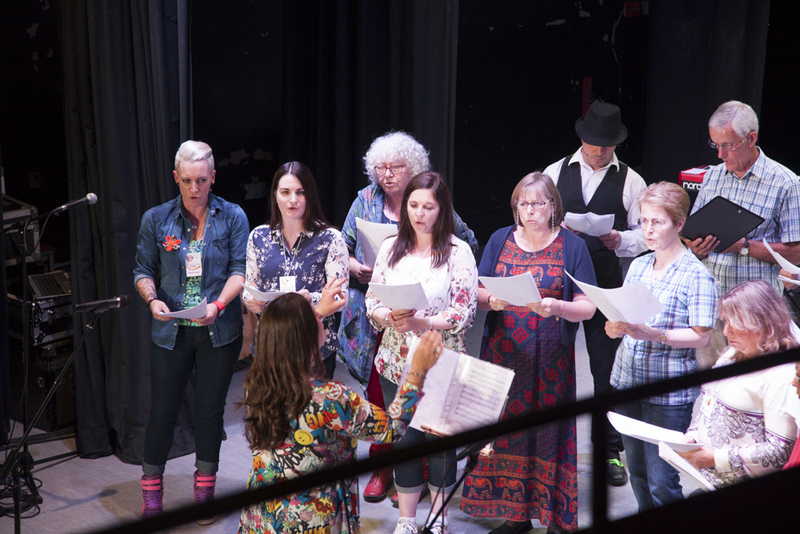 The 20-strong choir belt out half a dozen verses as if they’ve been singing folk for years. To the delight of the participatory audience they follow it with three more equally accomplished songs. It is, of course, a great success. More whoops and hollers and more big grins. At the interval that follows I grab a word with TimeStep dancer Holly’s parents. I haven’t been at St John’s long before I realise this group of singers is very different. “So this is straightforward for you?” I ask. 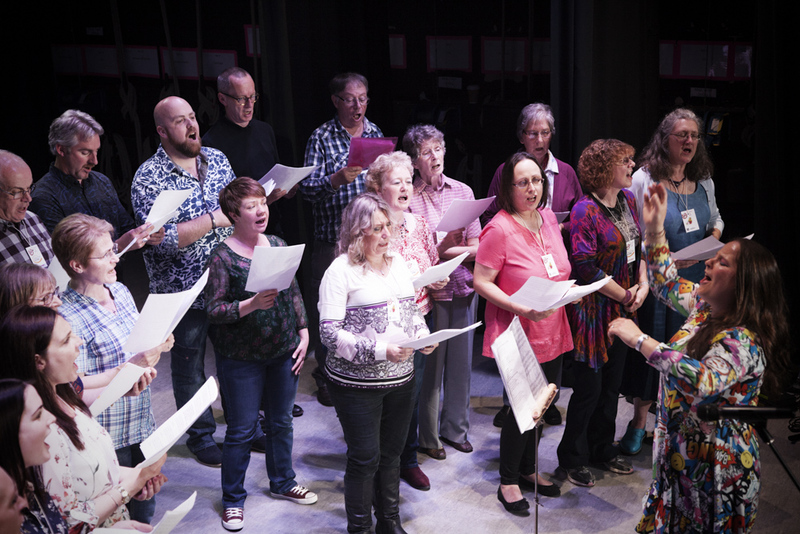 Tonight is the fourth and last rehearsal for this festival choir, brought together to perform with Batley Community Choir at this weekend’s folk festival. 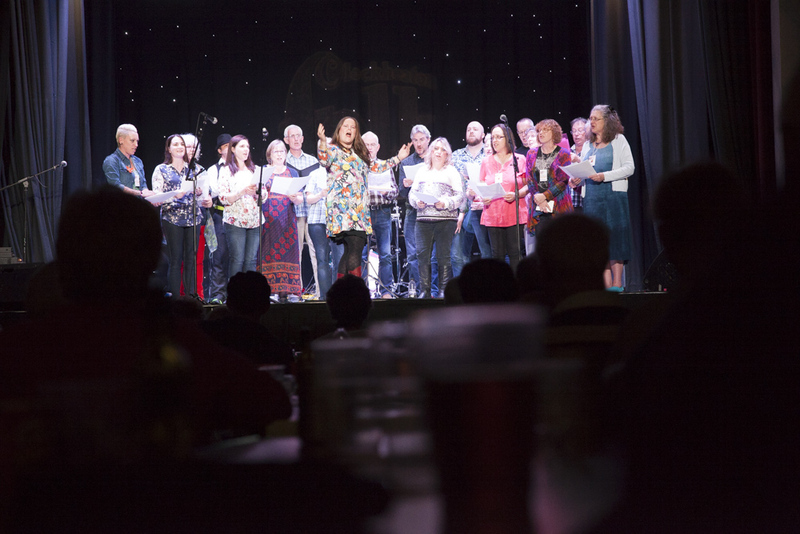 Whereas the Batley choir is well established but new to folk music, tonight’s singers barely know each other although, it seems, have some folk-singing experience. 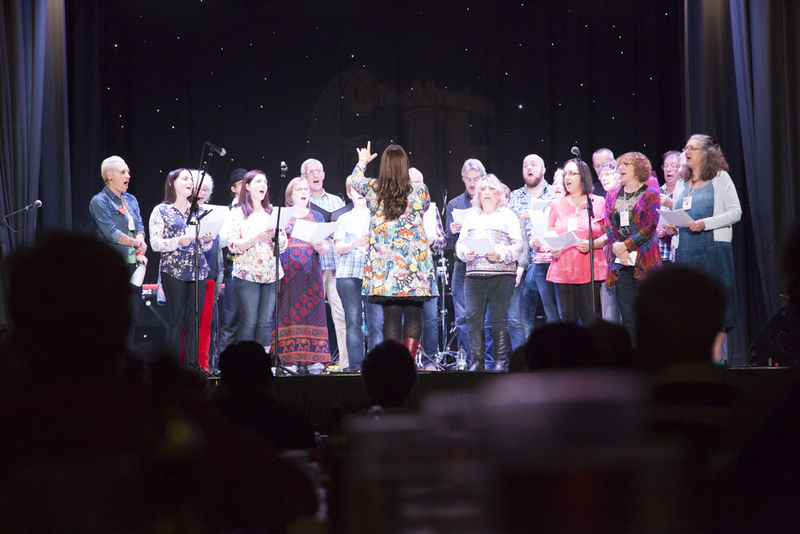 The two choirs will combine this Saturday night with the festival headliners, The Demon Barbers and a handful of other West Yorkshire community groups who, with Creative Scene’s support, have been working towards a show-stopping extravaganza. “So it’s been easier working with this lot?” I ask. 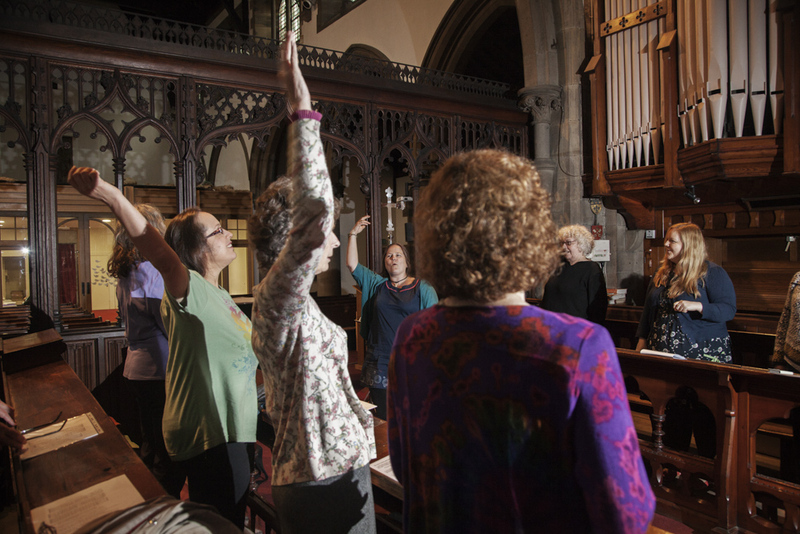 Once the choir has settled into the 150-year-old pews Bryony warms them up with stretching, shaking, rubbing, hugging and deep breathing. All wonderfully photogenic. I take my camera and tripod out into the nave where a man I haven’t seen before is sitting, listening to the rehearsal. “Are you not singing?” I ask by way of introduction. Brilliant. 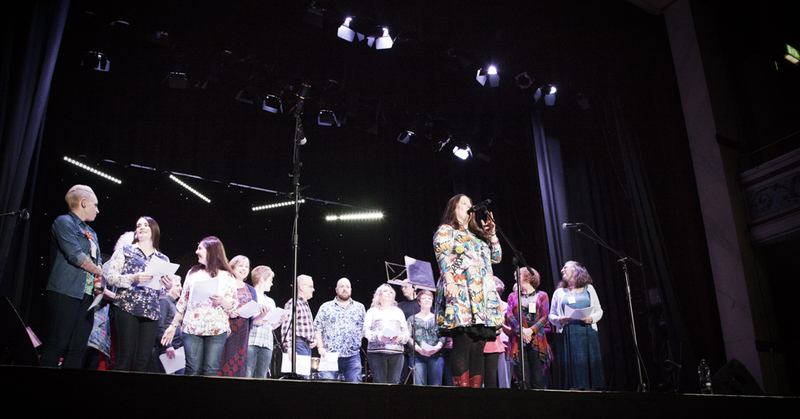 I exchange my camera for my tape recorder and, over the top of the choir’s rendition, grab the opportunity to ask Dave Minich how the collaboration between Creative Scene and the Cleckheaton Folk Festival came about. Said the gentlemen to the ladies, well how do you do? Well how do you do, my boys, by the light of the moon. “They’re loving it,” I say. 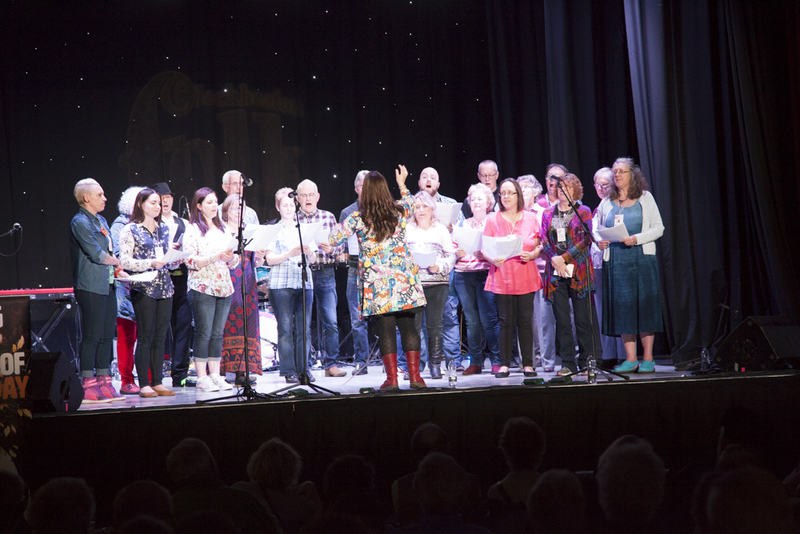 The Festive Choir and Batley Community Choir will join forces and perform together at Cleckheaton Folk Festival on Saturday, 2nd July. Tickets here. 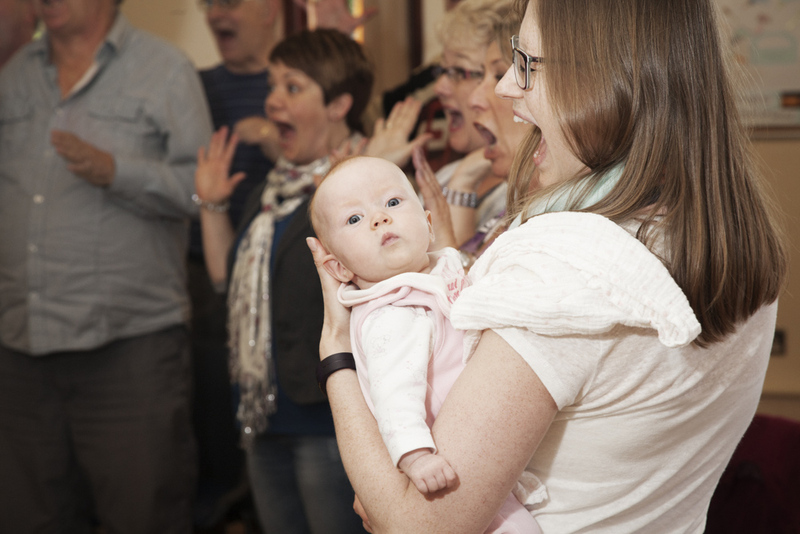 It’s been a rollercoaster couple of weeks for Batley Community Choir. 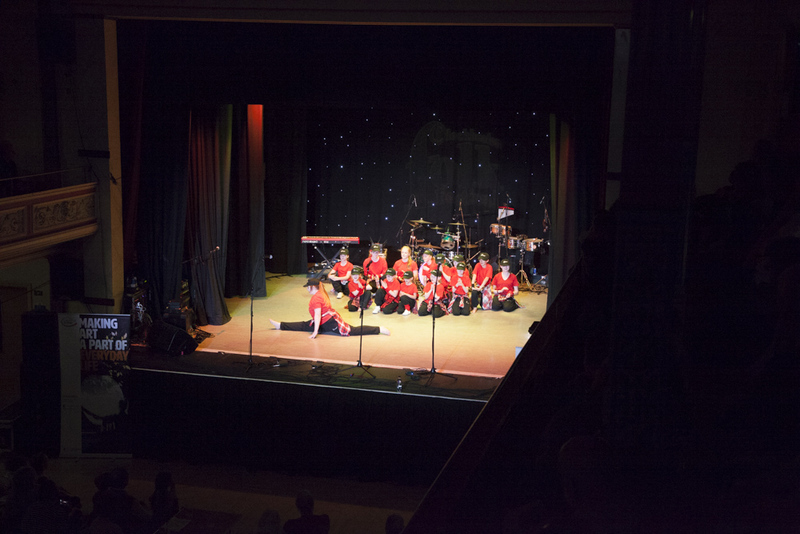 Ten days ago they hosted their first-ever concert at Batley Town Hall and had invited their local MP to attend. “Unfortunately she was double booked but instead sent us a bottle of parliamentary wine for the raffle,” says founder member Graeme Rayner ahead of tonight’s rehearsal. “That’s a big ask,” I say as I help him set out the chairs. 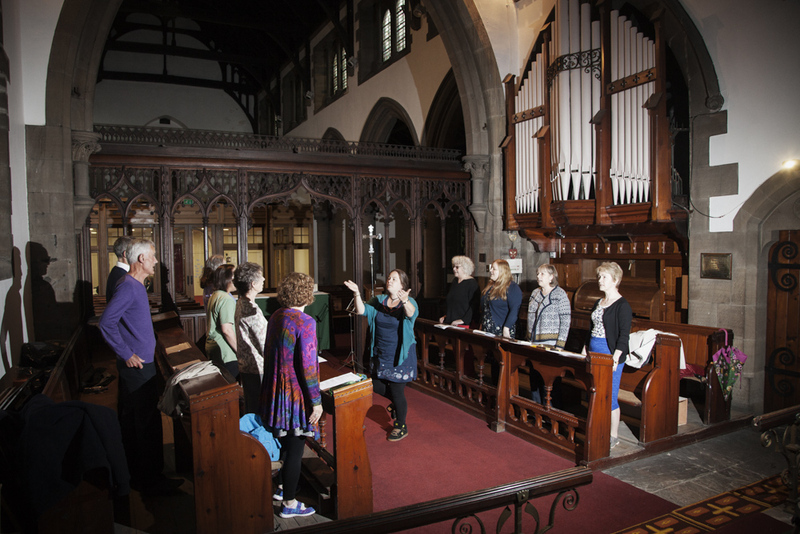 “I suggested they come up here – Batley is Jo’s home town after all – and they could film us singing in the church, which they did. It was a strange day. We were still trying to process the dreadful news but also prepare for a performance on national TV. Very surreal. 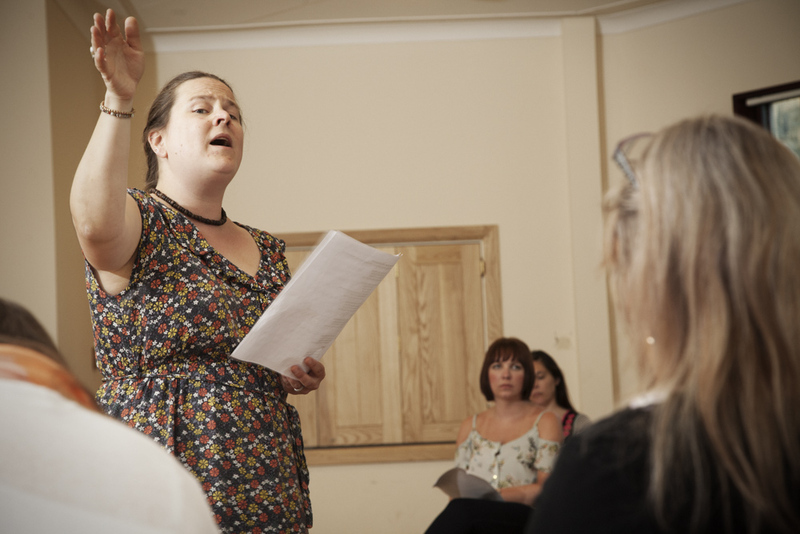 Tonight is the second rehearsal with singer Bryony Griffith from The Demon Barbers, the hip-hop and folk band that the choir will perform with at Cleckheaton Town Hall on Saturday, 2nd July. 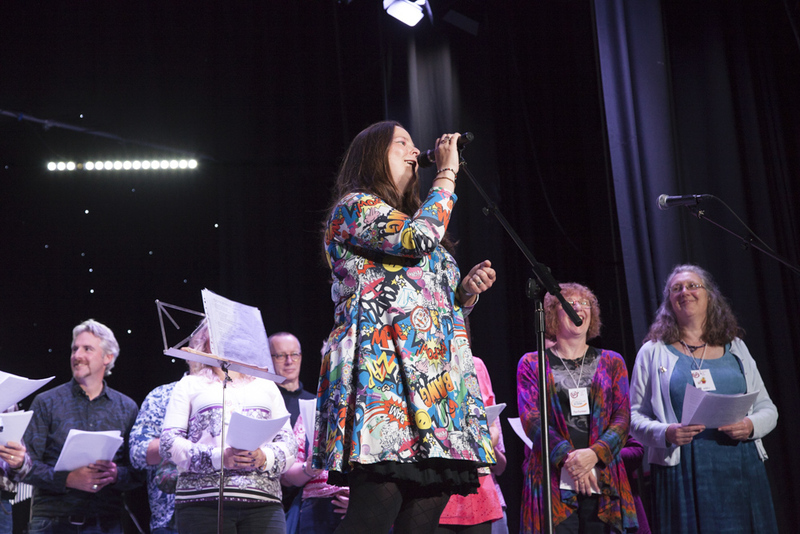 The choir is just one of half a dozen community music and dance groups that will share the stage for a ‘curtain-raising crowd-pleaser’. “So, you’re out of your comfort zone again?” It wasn’t that long ago I reported on the choir becoming opera singers. There’s much needed hilarity as The Demon Barbers vocalist gets everyone to make the sound of a horse ‘trump’ as part of their warm-up routine. And then, for the first part of the evening, she fine tunes We Are Three Jolly Fishermen, a quick-fire ditty they started last week. During the break, as juice is served from the hatch, I whizz round everyone asking the same question. And, apart from one soprano, a bass and an alto, it turns out this will be their first ever folk festival. 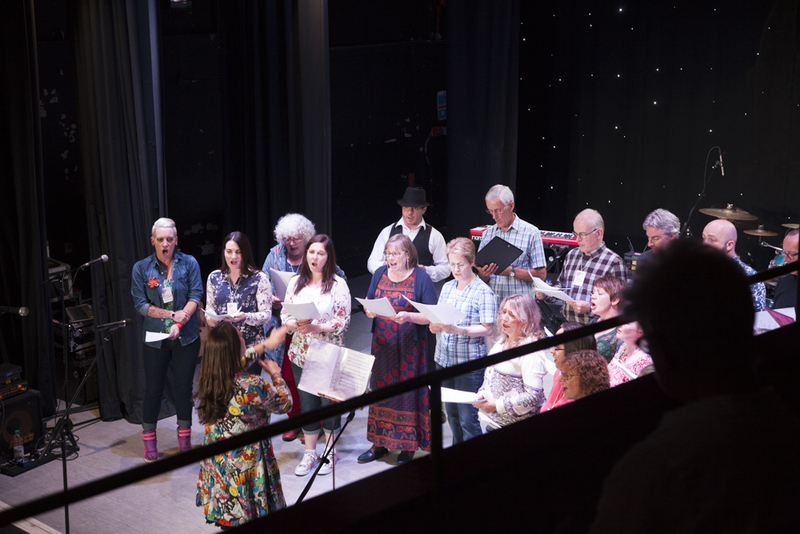 And maybe it will be a first for their friends and family too, which is pretty much what Creative Scene is aiming to do here: extending people’s experience of the arts, in all its forms. Definitely not ‘newbies’, David and Carol are both sporting festival wrist bands. They tell me they’ve been to Fairport Convention’s Cropredy Festival for the past two years and are going back again this year. “How long have you had these on?” I say of the sad-looking wristbands. 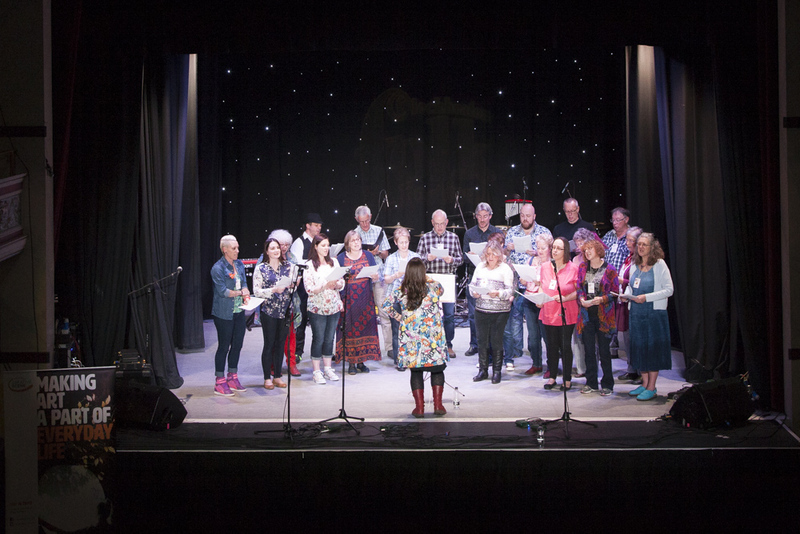 Batley Community Choir will be performing at Cleckheaton Folk Festival on Saturday, 2nd July. Tickets here. 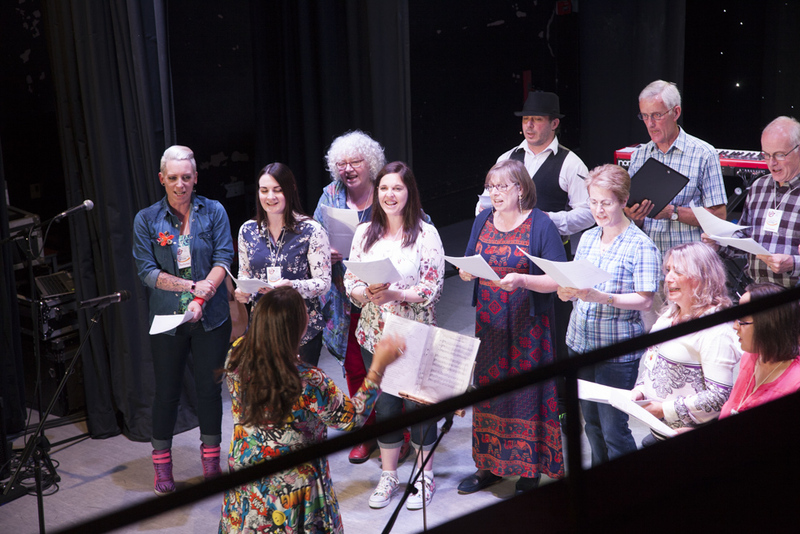 The choir will release their rendition of The Rose as a charity single in July with proceeds to the Jo Cox fund. Follow the Facebook page for more details. 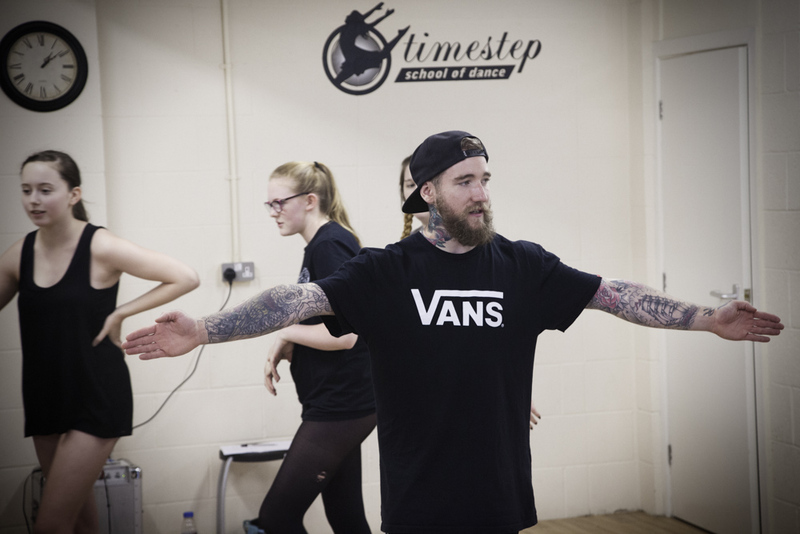 This is choreographer’s Ryan’s fifth rehearsal with the young dancers, with only a couple to go before the big performance at the Cleckheaton Folk Festival with folk-and-hip-hop-fusion group The Demon Barbers. 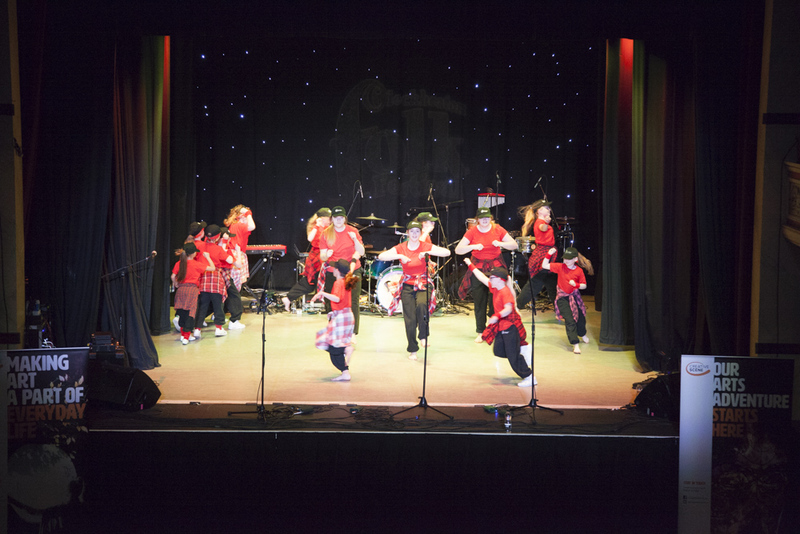 Supported by Creative Scene, this is one of a series of workshops where West Yorkshire music and dance groups work towards a main stage collaboration with ‘The Barbers’. 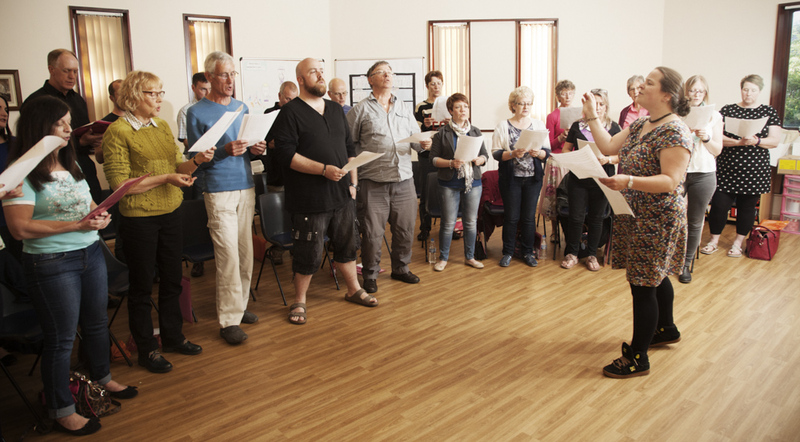 Soon I’ll be reporting from Batley Community Choir and from rehearsals of a second choir pulled together just for the festival. In the studio the young people are working on individual moves that get incorporated into their routine. I interrupt one group and ask their names. Molly and Harriet are sisters then there’s Nieve and Milly. “And what’s your name?” I ask the last girl. “I do gymnastics… musical theatre… ballet… senior theatre…” says Nieve. “And what’s the best thing about all of this?” I ask, gesturing towards the other dancers. “We get to learn different styles of dancing,” says Milly. 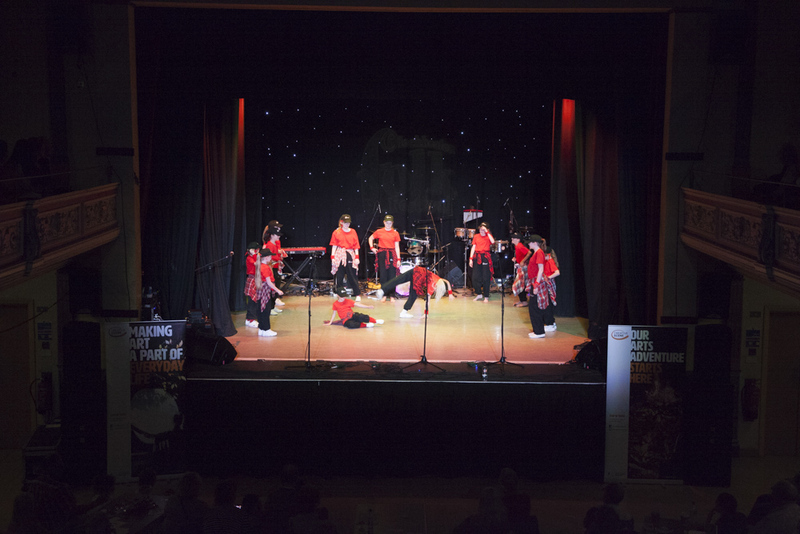 Their energetic routine with The Demon Barbers apparently features street dance, tap and folk with a sprinkling of morris dancing for good measure. 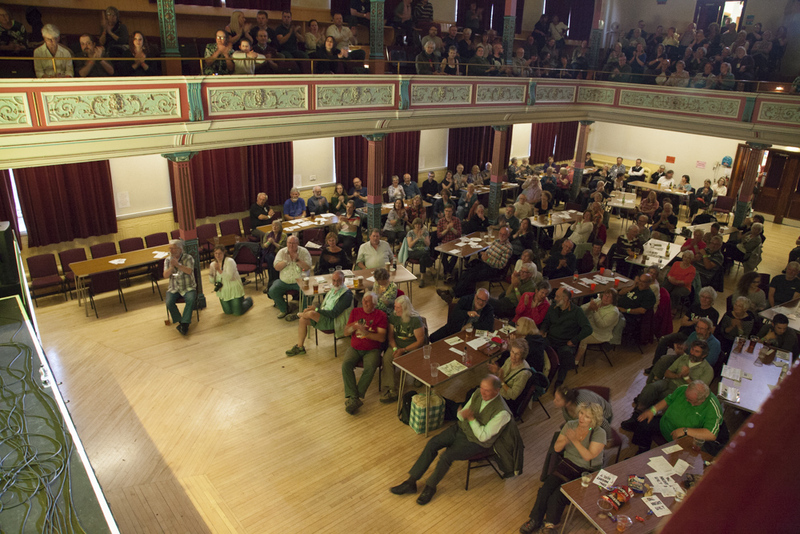 “And have any of you been to the Cleckheaton Folk Festival before?” I ask. “No,” they reply in unison. “It’s going to be exciting doing this in front of so many people,” someone says. I let this group carry on with their pieces and put my tape recorder in front of the youngest group. “My name’s Nieve, and I’m nine,” says nine-year-old Nieve. “And we’ve learnt some new moves,” says 10-year-old Katie. She tips backwards. “A back walkover,” she says, practically upside down. Collaborating with a diverse range of local talent wherever they play has helped earn The Demon Barbers a BBC ‘Best Live Act’ accolade. 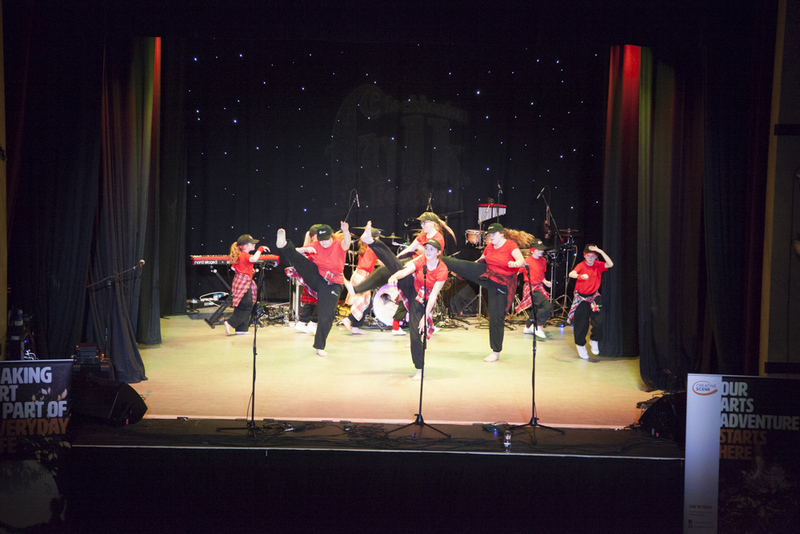 The weekend before they’re at Cleckheaton Town Hall, Ryan and the band will be at ‘Glasto’ with a beatbox and hip hop routine with breakdancers. 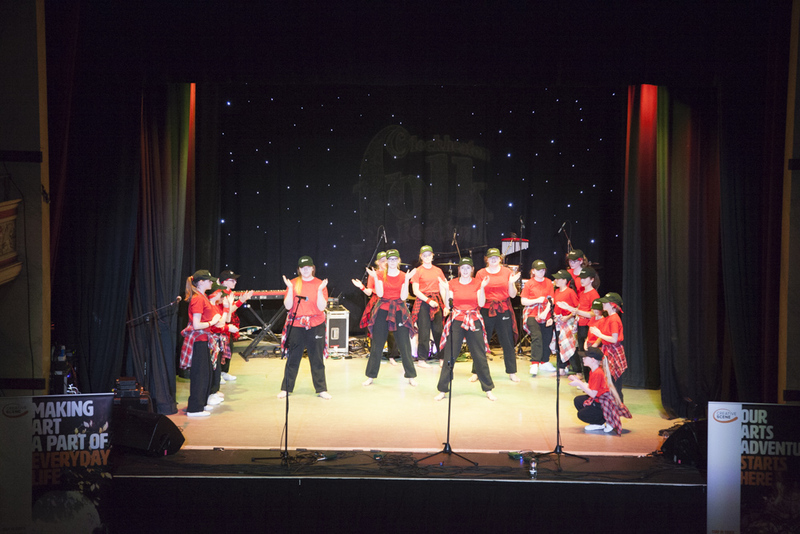 TimeStep School of Dance will be performing at Cleckheaton Folk Festival on Saturday, 2nd July. Tickets here.